Garden stairs are an essential part to any landscape idea and, of course, for gardening. You can utilize rocks in creating a step, but it must have at least one flat side. They are less formal than indoor stairs. 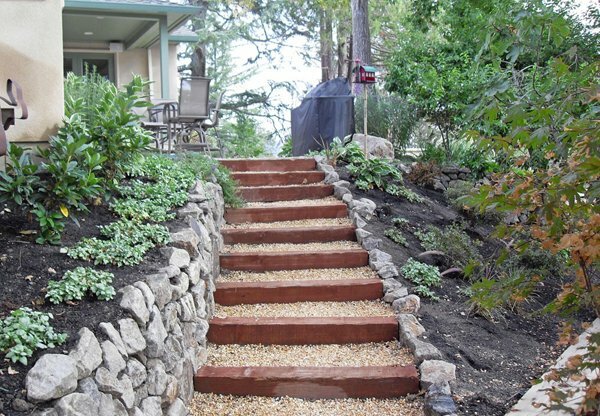 Home owners and builders can choose from a lot of varying styles of garden stairs in landscaping. The only challenge is in making it blend to the landscape to achieve that “wow” effect on people when they see it. Stairs on a garden offers ease of access and allows us to walk on the garden without walking on the nicely mowed lawn. They even serve as a walkway as well. In this article, we are featuring 15 Inspiring Designs of Garden Stairs to give you ideas in creating that perfect garden and landscape design. 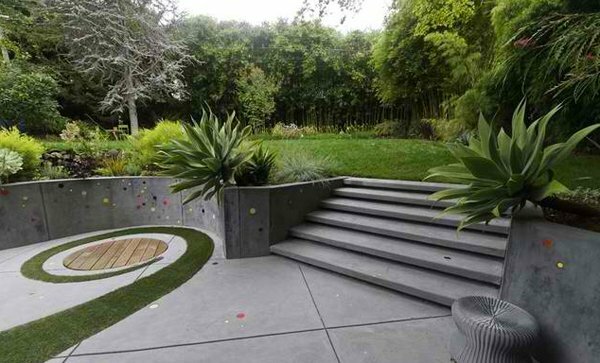 Modern inspired landscape steps that are perfect for homes on a slope. The concrete floating steps are lined with river pebbles that give it a bit of a Mediterranean look on a modern home. Classic Nursery & Landscape Co. This traditional inspired long but shallow step looks natural and blends well with the greenery. It is made of charcoal mossy looking stamped concrete and natural stones for a more “into nature” inspired design. 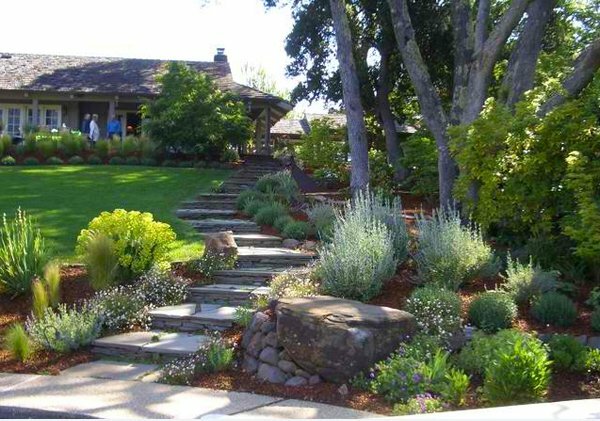 A unique blend of casualness and formality is brought about when we see this kind of landscaping. 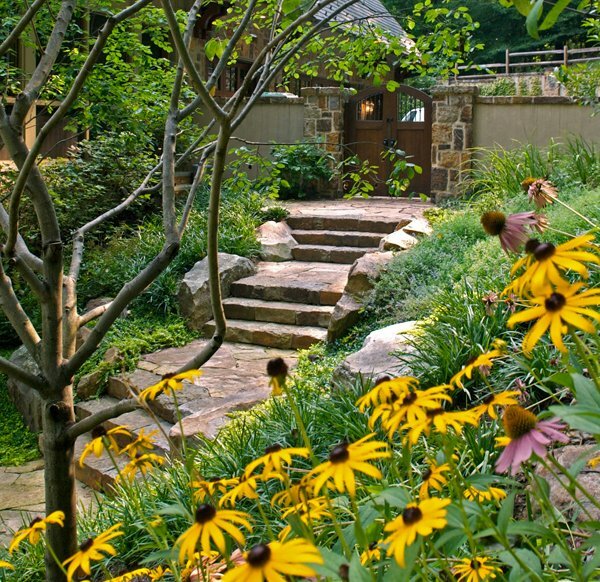 The steps are made of rugged fieldstone for a naturalistic traditional look and the formality of the green bushes completes the whole “simple and elegant” landscape design. 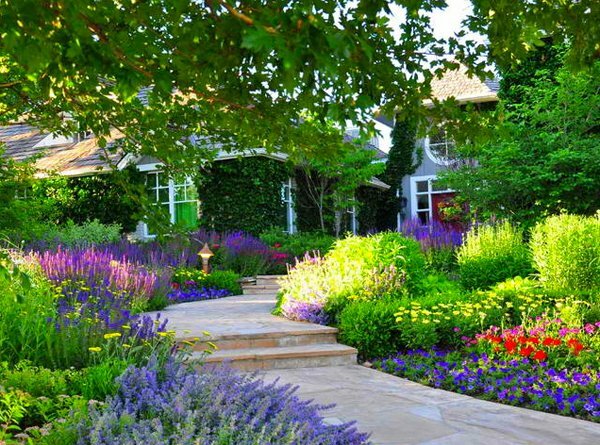 A simple yet beautiful traditional landscape design. The simplicity of the stone long pathway combined with the expert plant selection and stunning coloured flowers contribute to the dramatic effect of the landscape. 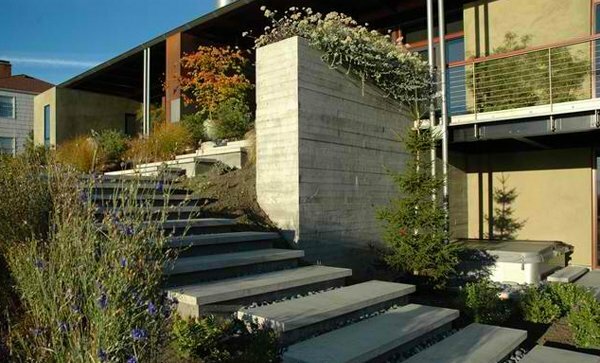 This modern floating concrete steps is simple and beautiful all in one. The funky coloured polka dots on the concrete and the swirl of grass adds a funky edgy look to the design. This beautiful terracing stairs are made with full range bluestone that is durable and unique which can withstand any climate, perfect for exterior design and landscaping. The combination of the plants surrounding the area and the beautiful steps combination is simply stunning. 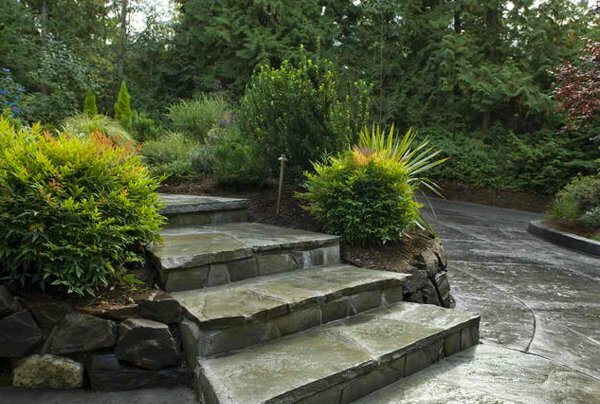 This contemporary landscape steps are perfect for those who prefer using natural stones for landscaping. The buried side rocks along the edge and the natural paved boulder gives the all naturalistic landscape design. 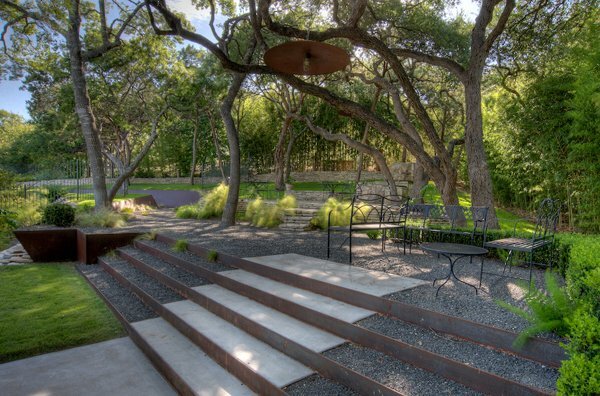 A modern inspired landscape that also doubles as a relaxing patio. The wood used in this walkway step is ipe wood that is unstained and weathered, a type of wood that is highly durable and resist flame. The steps angled and changes direction to suit the landscape that is surrounded by plants. This Asian inspired exterior landscape is charming in its own way. 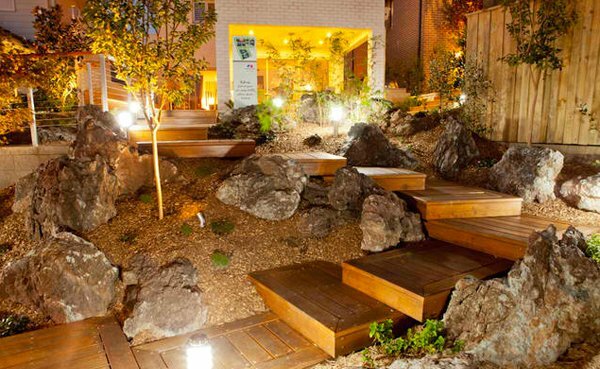 The framed wooden steps, light on the walkway and the rocks are simple yet elegant. 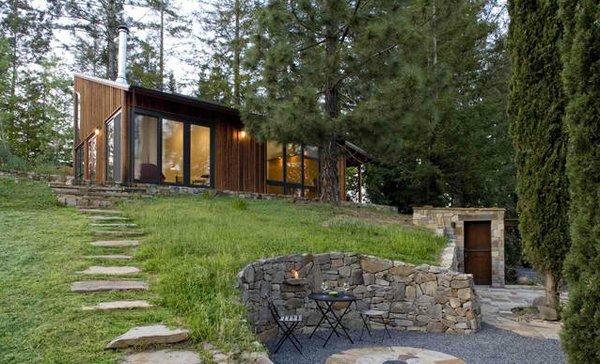 Those stone steps look natural and free forming. It is great for the side of the hill because it looks so natural, as if it was meant to be there. This is truly a beautiful contemporary inspired landscape. Keith Willig Landscapes Services, Inc. 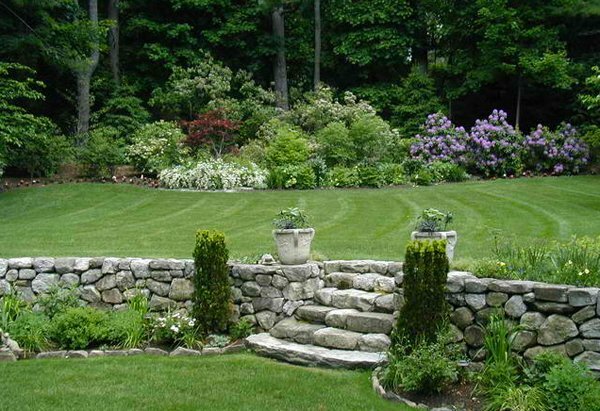 This traditional landscape steps utilizes stacked stones for risers to give it a unique edge and a more traditional sense. 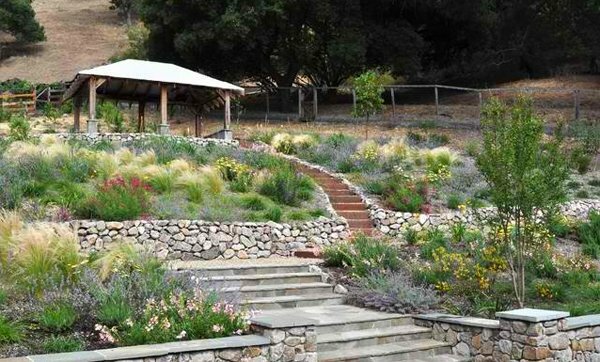 It is the perfect design that fits a hillside, with longer walks between steps, wide stone stairs and those native plants that adds beauty to the landscape. Frank & Grossman Landscape Contractors, Inc. 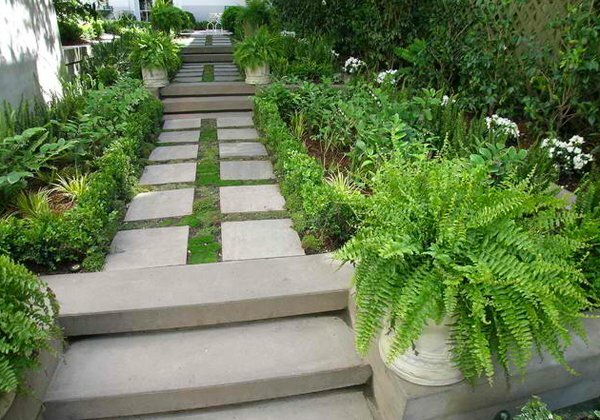 This conventional traditional concrete steps are perfect for narrow shady places because it lightens up the atmosphere, especially when it is combined with green plants and ferns on either side. It is simple yet inviting. This traditional landscape stairs was designed by Alder Group, Pool and Landscape Co. 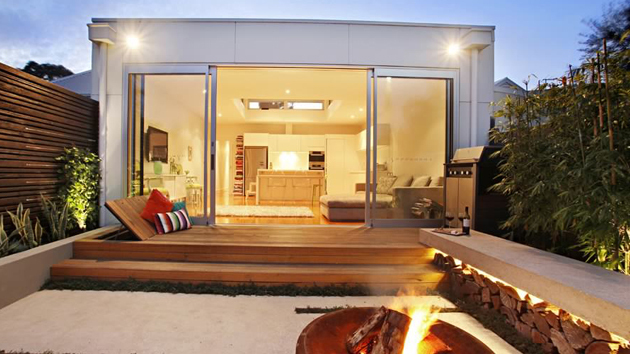 They utilized railroad ties that blend well because of its neutral colour; it is easily available and durable. 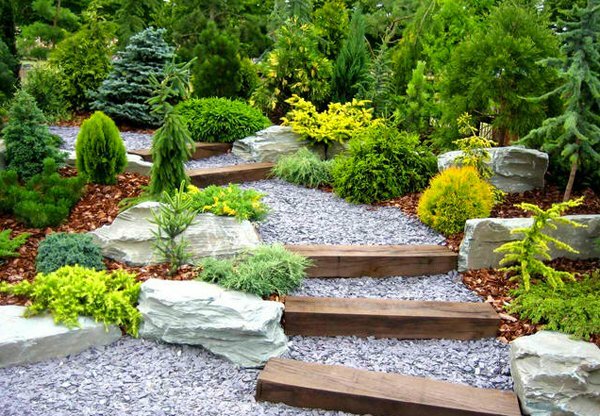 The gravel stone border and the ties for steps are a perfect combination for the landscape. A Japanese traditional landscape inspired design with the perfect combination of colours for a dramatic and invigorating feel to the surrounding. The light and dark greenery combined with the grey gravel and unique wood steps in the garden is just so inviting. An unusual combination of basalt gravel and concrete poured steps on steel treads. This contemporary landscape steps are still pretty with varying colours and textures. It is simple yet attractive and pretty. Garden stairs will always follow landscaping gardens one way or another. They are useful and most importantly, they add beauty to the garden. 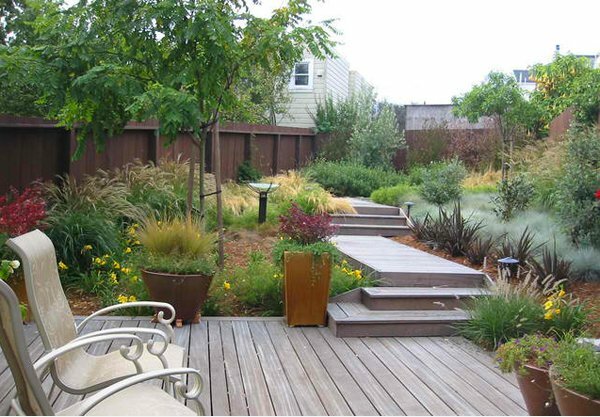 Aside from stairs, garden pathways are also used to access your yard. These also come in different designs that will fit your landscaping concept. Hope you get the inspiration you needed and feel free to check out our other articles for home design inspirations.